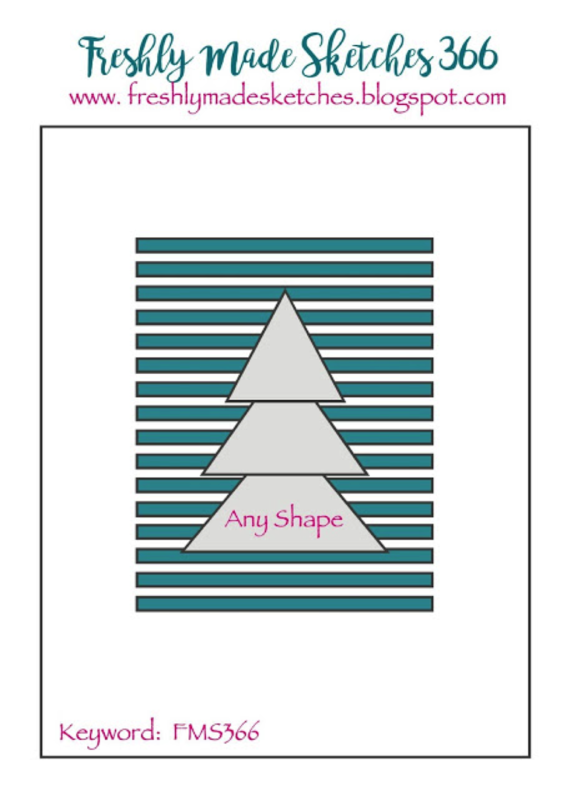 Welcome to our newest challenge at Freshly Made Sketches. This week we have some exciting news! For the next two weeks we are thrilled to announce a Design Team call! Yes, we are looking to add to our fun team of enablers. All the details to apply the Design Team are on the challenge blog. On to the sketch. This week our cool sketch has been designed by our fabulous sketch designer and ultra elegant card make Cecile Ribon. So my initial thought was to replicate a Christmas tree like the sketch, but I decided to change things up and go with a layered floral card. 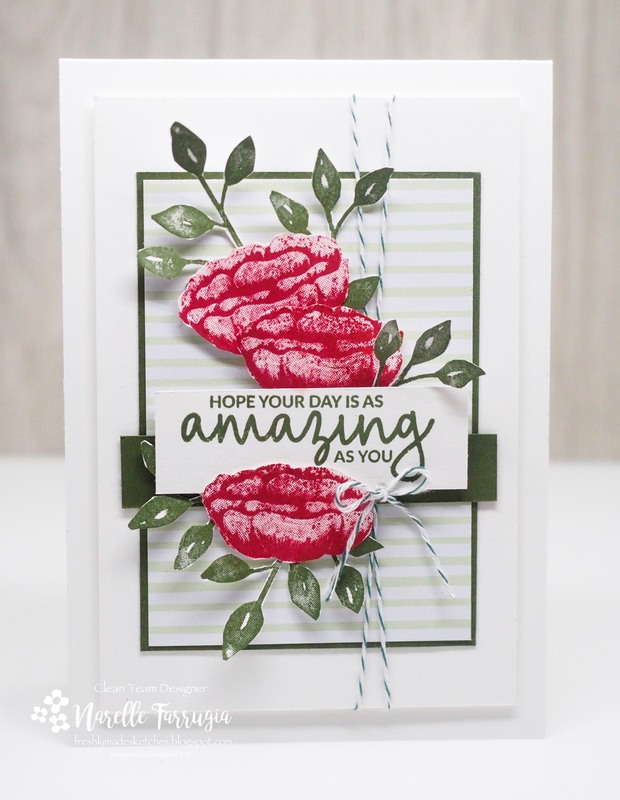 I received Incredible Like You at our recent Stampin’ Up! Onstage Event. Of course I was in love with it as it’s a flower set and you know how much I love them. I’ve stamped my flowers in Lovely Lipstick and fussy cut them out. I then stamped my leaves from Petal Palette in Mossy Meadow Ink and gave them the same fussy cut treatment as the flowers. The designer series paper I’ve used in the background is from my 6″ x 6″ Subtles DSP stack. From memory I used a piece of Soft Sea Foam. I then matted it with some Mossy Meadow Cardstock. I added some bakers twine and a sentiment stamped in Mossy Meadow, also from Incredible Like You. The font used for the sentiments in this set are so pretty and elegant. 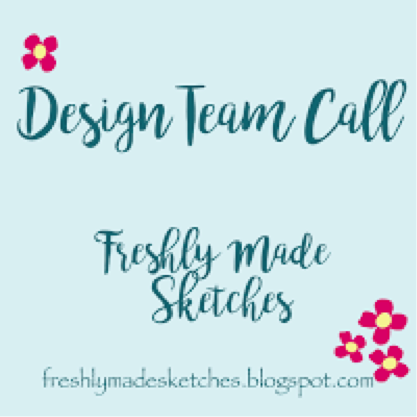 Head over to Freshly Made Sketches to see what the talented cardmakers at Freshly Made Sketches have designed and while you’re there, read all about our Design Team Call. Love this new stamp set…..gorgeous flowers! And oh those cut out leaves…..perfect! I love working off of sketches. This is just beautiful. Well done. This is such a gorgeous card Narelle! I love those flowers! They are just beautiful! The pink and green look perfect together! So pretty! The fussy cut master is at it again! This is gorgeous with such bold and vibrant colors. I love those bright, bold flowers against the pretty, soft background. And your fussy cut leaves — wow! This is lovely!! I like the pretty flowers you used against the light background. GREAT design. Beautiful! The striped paper works perfectly for the sketch and looks lovely behind these flowers. Breathtaking!! This is really amazing!